For national player Nico Schulz, the upcoming match of his TSG Hoffenheim against Hertha is certainly a special one. The fast left winger, who was also recently associated with Borussia Dortmund, was not only born in Berlin, but also laced for 15 years for the “old lady” his football boots. His first 52 Bundesliga games completed Schulz for the capital club, before he migrated south to TSG and there matured to DFB selection player. However, the 26-year-old does not need to bring gifts with him from his former club, especially since the home blessing in the blue and white guests after the last four defeats in a row hangs awesome. In this critical phase of the season, coach Pal Dardai’s side would probably find it easier to play than an away game at the PreZero Arena in Sinsheim. In fact, the home side are currently one of the hottest teams in the Bundesliga. An impressive ten points from the past four games mean that between Hoffenheim and Hertha, the odds for the tip to a home win not even exceed the 1.45. The “nail men” played at home against Leverkusen (4: 1) as well as in Augsburg (4: 0) in a veritable intoxication and celebrated unblemished successes, which now make them dream again of international business. The motivation of 1899 is unbroken and the prospects that the series of success can be continued, absolutely rosy. At the meeting Hoffenheim vs Hertha is therefore a prognosis on the home win obvious. Already in the first round we expressed our concern that the departure of coach Julian Nagelsmann at an early stage during the course of the season could possibly have a negative impact on the performance of the TSG 1899 Hoffenheim. At the beginning, when we were confirmed with this suspicion, the Sinsheimers on the home stretch seem to be able to mobilize all their strength once again. Surely it would be presumptuous to attribute the good run solely to the official announcement of the successor of Nagelsmann Alfred Schreuder, yet a connection seems obvious. With the feeling in mind to get a coach from summer, who already knows most of the players and wants to continue the philosophy of the coach, the Kraichgauer act in the two games after the international break as winged. The 4: 1 statement victory at home against Bayer Leverkusen was followed by a similarly unexpected 4-0 win at FC Augsburg. Including the two matches against VfB Stuttgart (1: 1) and 1. FC Nuremberg in the consideration, the TSG brought in the past four matchdays a whopping ten points. Only Eintracht Frankfurt was even more successful in this period (twelve counters). 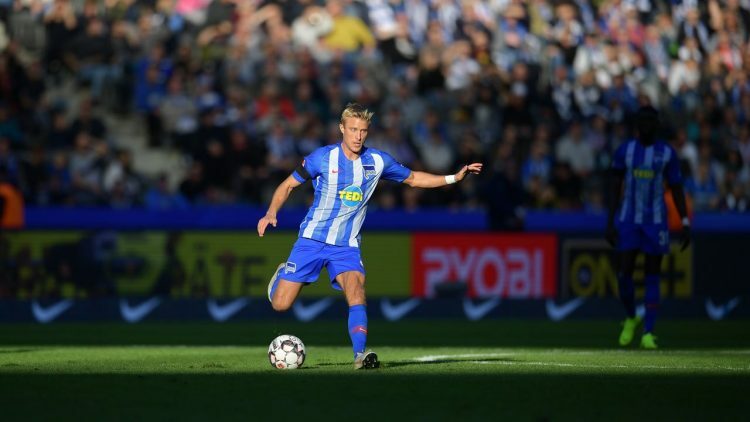 The accumulated confidence from the strong performances is an important argument to justify the tip on home win between Hoffenheim and Hertha. With a total of six wins, five draws and three bankruptcies, the Sinsheim are currently the sixth-best home team in the Bundesliga. Interesting here is the fact that in the second half three of the five matches were won in front of their own fans and the TSG also led three times already at half time. In general, the “nail men” presented in recent weeks as a real early starter. Unlike the four halftime guides in the last six games can not be explained. That this year’s Champions League participants laid down a grand final spurt in the preseason, could also be of elementary importance for the head. In addition to the return to imposing their own game on each opponent, it is the storm duo Kramaric / Belfodil, which leaves the blue and white at the moment only one point behind sixth place from another year at European level dream. Both attackers come after the winter break on no less than nine hits. This brings the Croatian-Algerian combination 18 of the 26 TSG goals in 2019. In the previous week, the former Bremen Belfodil in Augsburg became the match winner after he steered the ball three times over the goal line. It is quite possible that the congenial team will strike again on Sunday afternoon. Due to injury, Julian Nagelsmann, who will be coaching his third-to-last home game in the Rhein-Neckar region, will be without Dennis Geiger, Lukas Rupp, Robin Hack and Joelinton. Compared to the two successes mentioned above, there will be hardly any changes in the starting lineup, despite the fact that the youngest Bundesliga coach of all time will only decide after thorough analysis whether he will be in 4-3-3, 3-5-2 or in the 3-4-3 system. While the teams in the table cellar in particular are saddened that “only” six games have to be played, in the former Olympic city the number of minutes until the end of the season is counted. This impression was conveyed by the “old lady” at least in the past weeks. As in the last few years, the blue-white players play a much weaker second half of the season in comparison to the first half of the season and bobble around in the gray midfield of the classification. The European ranks are just as little an issue as the struggle for existence. And because boredom in the iconic capital actually only seems negative, coach Pal Dardai was recently exposed to massive criticism. The Hungarian coach, who has managed to bring continuity into the wild Hertha environment, is primarily accused of stagnation in the development of the team. Whether this accusation is justified or lies in an exaggerated expectation, everyone should subjectively decide for themselves. The fact is that the squad is peppered with numerous promising talents, but lacking the necessary consistency in the course of a long round. Currently, the “old lady” is experiencing a crisis. In the past four Bundesliga games, the Berlin each drew the short straw. The performances at home against Dusseldorf (1: 2), in Leipzig (0: 5) or in Freiburg (1: 2) were decisive for the fact that even Pal Dardai himself asked the rhetorical question, if he was still the right one for the job be with his heart club. Because such incautious statements do not pass the pros without a trace, the uncertainty in the BSClern is huge and Dardai could never win in the coaching duel against Nagelsmann, results in the encounter Hoffenheim vs Hertha a prediction on the home side’s victory probably more meaningful. To make matters worse, the Berlin, in contrast to the TSG, in the last few years on the home stretch of a Bundesliga season regularly did hard. In the final six games in the recent four seasons, the Hertha only adds four wins in 24 duels. The three away games in series (1: 8 goals) and the lack of intrinsic motivation due to the table situation make the task in Kraichgau even more difficult. With Duda, Darida, Grujic, Lustenberger, Ibisevic, Torunarigha, Maier, Jastrzembski and Luckassen numerous potential tribe and key players are injured or suspended. Therefore, it is virtually impossible to give a hint to the guests between Hoffenheim and Hertha. With seven wins (five draws, five defeats), TSG Hoffenheim leads the direct comparison against Hertha BSC. Under Julian Nagelsmann 1899 against the capital club in six games incidentally still unbeaten (three successes, three draws). The first leg of the season ended 3: 3, with the Kraichgauer at half time with 2: 1 front and in the meantime even moved to 3: 1. Thanks to a strong final phase, the Dardai team fought another lucky point. Mention should finally find the fact that the TSG in three of the four home victories against the “old lady” already led after 45 minutes. At lunchtime at 13:30 clock it comes on Sunday for a duel of opposites. While Hoffenheim was in great shape lately and scored ten points from the recent four matches (including two wins in a row), the “old lady” is currently going through a difficult phase. Four times in a row, the Berlin left the field as a loser. Above all, the defensive knew in twelve outings in this period anything but convincing. Because the team of Pal Dardai was already known in previous years for playing bad rounds and beyond having to give up some important regulars, between Hoffenheim and the Hertha a prediction on the home win is definitely defensible. The Kraichgauer are bursting with self-confidence and want to set, as against Leverkusen and Augsburg, right at the beginning of the game first important fragrance brands. Storm duo Kramaric / Belfodil are in excellent form and will be unstoppable with the weakened and unsettled BSC defense. For this reason, we expect in the first round a small preliminary decision in favor of the table screen, which also has the motivational advantage on his side. We therefore decide in the unequaled duel Hoffenheim against Hertha for the tip to passable odds on the fact that the Sinsheimer are in the lead after 45 minutes and win in the end.